PAUL DERVAN: Opportunity for aircoach? I remember recently reading somewhere the question "What brands would you miss if they disappeared tomorrow?" I'd miss the aircoach. I always take it when arriving home from the airport. Last week, I noticed some advertising for Nivea Men products on the back of one of their buses. 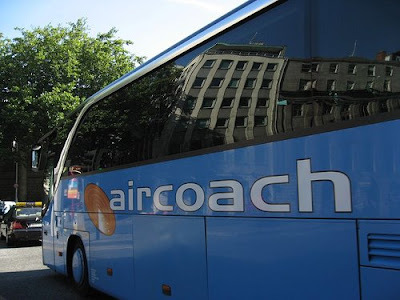 I wondered if aircoach could do other interesting stuff with brands, beyond advertising, that might be useful to consumers? For example, would Nivea consider giving away small promotional sample packs on the aircoach? Tighter flight restrictions means I find myself continuously buying small tubes of toothpastes and mini deodorants. In situations like this, I'd be delighted to sample their products and read their collateral. Thinking of other brands that could benefit from this opportunity - I'd love if Barry's Tea got in on the action and threw a few tea bags my way while on the aircoach. I always forget to pack them and do honestly miss them when on holiday. A little gesture like that would probably secure my loyalty for another ten or twenty years. I realise that advertising on the back of the bus is not targeting the people on the bus. That aside, there might be an opportunity for aircoach to build a service for brands who want to connect with us in the hours leading up to our flight or immediately after our flight home. Good for us. Good for brands. And a bit of extra revenue for aircoach - so they don't disappear anytime soon.